Nobody is going to argue that the Wii doesn't suffer a few genre gaps in its library. One of those gaps is where the third-person shooter should go. That seems strange to me because really, the Wii Remote pointer always struck me as a perfect compliment to the genre. Thankfully, my trusty N64 can still provide me with some good-to-fantastic choices in this category—and since my game-playing has been thematic lately, I figured I'd play them all in one lump. 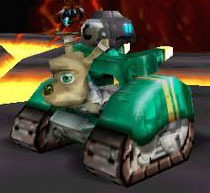 Buck Bumble could be the poster child for first-generation N64 draw distance fog. It's practically claustrophobic. It's also one of the uglier games on the system, with simple, angular models, hideous textures, and a low frame rate. But for some reason, I like it. Buck Bumble falls under the "guilty pleasure" heading to be sure. It's really not a bad game, despite its numerous graphical flaws, and no doubt has one of the most memorable songs to ever grace a title screen. As you can see, the game is set in London. 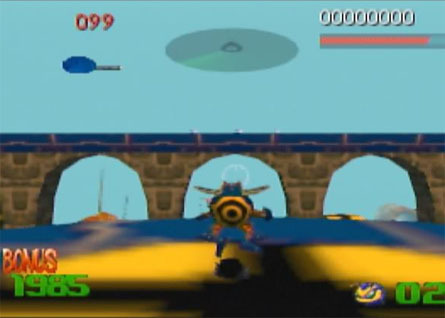 You fly freely around the levels as a heavily armed bee. 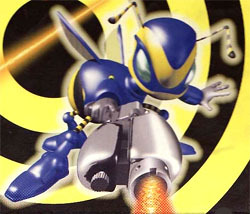 Flight control is solid, aiming is simple, and while enemies are rather generic looking bugs, they come in a large number of "species," each with a unique way of attacking. The missions also vary up their objectives pretty well. It really shouldn't be a surprise that the flight mechanics are as good as they are though, since this title was developed by Argonaut Games, who some may remember had a big hand in developing the original Star Fox and the FX chip that ran it. Buck Bumble also features a final boss that never fails to creep me out. It's a giant evil praying mantis thing decked out in wasp colors that attacks you in a very dark cave. Then it turns into a flying caterpillar that slowly pursues you until you finally kill it. I'm not the type to find most insects creepy, but the Herd Queen always bugged me. I wonder if the license for Buck Bumble is still buzzing around out there. I'd really like to see a modern take on it. I love to fly around in games but rarely find a game with flight mechanics I enjoy. What's more, Buck Bumble offered a perspective on the world not seen very often, a bug's-eye view where the mundane takes on dimensions of the fantastic. The primitive graphics of Buck Bumble don't really do it justice, but a modern sequel or remake could be a real eye-catcher. The character design for Buck still holds up, but also pokes at a pet peeve of mine. Dammit, the character is a bee, and therefore should be female. The males don't do much beyond mate with the queen then die. Yet, cartoon bees and ants are always portrayed as guys serving a queen. Can this please freaking stop? Back during the lifespan of the N64, Rare was a force to be reckoned with. It could be reasonably argued that they stood shoulder to shoulder with Nintendo and helped carry the N64 through its numerous game droughts. Starting with the SNES' Donkey Kong Country series, I've owned a number of Rare's games. However, while each game offered a great experience for me on my first play through, the shine always wore off pretty fast any time I attempted a replay. Banjo-Kazooie was just a flashy derivative of Mario 64 with way too much crap to collect. Diddy Kong Racing wasn't as good of a racing game as Mario Kart 64, though the adventure stuff was kinda neat. As for Donkey Kong 64, it was just Banjo-Kazooie again, but with even more crap to collect and 4 characters to drag it out. 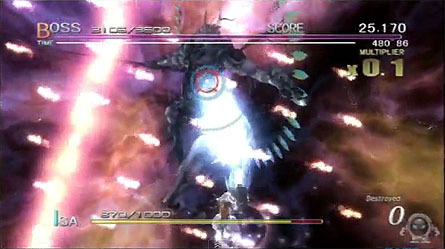 The boss fights were spectacular though. Every Rare game I've owned eventually ended up in a garage sale, with one truly amazing exception. 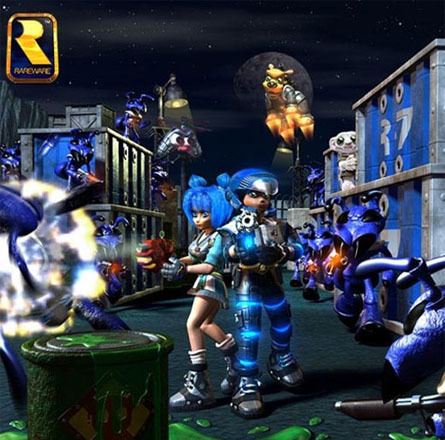 Jet Force Gemini is probably one of the most original games created by the studio. The play mechanics are tight, the worlds are sprawling, beautiful, and unique, the music is full of grand orchestral bombast, the enemies act intelligently, and even the inevitable collecting component contributes to the game's challenge in a way I can appreciate. As far as I'm concerned, JFG is the finest game to come from Rare, past or present, and a game far ahead of its time. While browsing YouTube for videos, I read comments that likened it to everything from Halo before there was Halo to Ratchet and Clank before there was Ratchet and Clank. Replaying it, even though I remembered it as an amazing game, it's still a bit of a surprise to see how well it stands up to (and even surpasses) modern comparable games. Of course, it isn't quite perfect. Rare had a habit of pushing the N64 beyond its comfort zone, resulting in frame rates sacrificed on the altar of graphics, and JFG does stutter. But far worse on the eyes is Rare's love for glassy, dead-fish-eyed characters. I swear they stare right through you. The final aspect of this game I thought I'd mention is how remarkably gruesome it is. Gory just doesn't cover it. Friend and foe alike can be not simply shot, but electrocuted, decapitated, set on fire, and reduced to a chunky spray of screaming giblets. Death can come swiftly or in slow, twitching agony. One boss dies as pieces of its face blow off, accompanied by heavy, tortured breathing. You can collect decapitated heads, including the heads of the hostages you're supposed to be rescuing. But hey, the characters are cute and the bad guys are bugs, so Teen rating all the way! 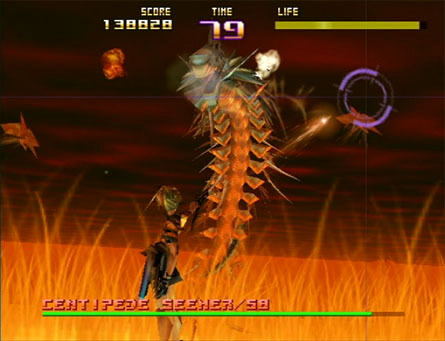 Towards the tail-end of the N64's lifespan, a rail shooter titled Sin and Punishment, developed by Treasure, was released in Japan, and while there was an initial buzz that it might come stateside, the game ultimately didn't arrive on US shores. Many Nintendo fans, myself included, were upset by this, because S&P looked amazing. What's more, the game was already voiced in English with only a couple menus in Japanese (granted, the quality of the voice acting makes me think some Treasure employee wandered onto a US military base and asked random people if they wanted to be a voice actor for a day). Not long after it was released, I had a chance to play it on a friend's modded N64, and it was indeed glorious. A few months after that, I bought my first and only import game. But, I had a problem. I didn't want to mod my N64. Modding an N64 is no big deal—the lock out was a physical one, not software. Two plastic tabs in the cartridge slot make games from other regions impossible to insert. Remove the tabs, and your N64 becomes region free. I however, couldn't bring myself to perform this little operation. I wasn't concerned with voiding any warranties, it was and is just an irrational hangup. Thus, my copy of the game remained sealed in its Japanese box for another month or so. Later on, while browsing around the internet, I came across a picture of a modded cartridge that had a couple holes hacked into it to fit around the tabs in a Japanese system, and the solution occurred to me. I had an N64 game I was planning on selling (Castlevania 64). Rather than sell it, I'd take it apart and swap out S&P's cart back with the US cart back. With the help of a cuticle clipper to remove Nintendo's custom screws, I had my Frankencart and finally enjoyed my game. It wasn't until 2007, thanks to the Wii's Virtual Console, that North Americans got to enjoy S&P legitimately. Then, in 2010, Treasure, a developer that rarely makes sequels, gave us Sin and Punishment 2 for the Wii. Recall what I said about the dearth of third-person shooters that take advantage of the Wii Remote's pointer? Treasure showed how it was done, combining shooting, close range melee combat, jumping, flying, dodging, and directional control of your character. It still remained on rails, but I see no reason the control scheme wouldn't work just as smoothly for a free-roaming game (oh Metroid Other M, what you could have been...). Okay, this one isn't really a third person shooter in any way beyond a technical definition. You do play in third person and you do attack by "shooting" so good enough. 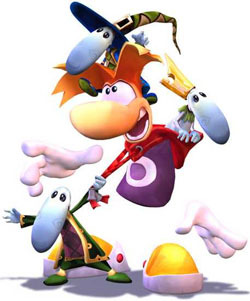 Rayman has always been an "also ran" mascot character. Never ranking too high, yet never associated with innumerable awful, broken sequels like some other mascot (though one might argue the Rabbids dragged him down a bit before they went completely independent). My first Rayman game was this one, and it's a beauty. Rayman 2 was and is quite a lovely game for the N64, with a great sense of aesthetics, solid game play, and loaded with quirky characters that range from goofy to vaguely creepy. In the style department, it's no Rayman Origins, but it's still an eye catcher for the old system. It's also an occasionally maddening game to play. Not a difficult game overall, there are sections of pure frustration where I don't simply die, but I die over, and over, and over... that little rocket thing is a suicide ride for one. Also, not only do you have to ride a flying rocket through tight areas while avoiding homing missiles for the final boss fight, you have to survive a rather long, twisting, obstacle-laden path just to get there. The sequels that followed Rayman 2 were okay, but not nearly as strong, until of course Origins came along. Unless you hate platformers, you should buy that game on whatever system you like since it came out for, well, all of them I think. Only a few more N64 games to go, then I'll be jumping ship to the Playstation. Next up, Mario diversifies his portfolio.